Folk Art And Pottery In Them Thar Hills! Bo Thompson has brought the ring jug into the sculptural world by including creatures of many sorts. These rooster enhanced rings sold for $120 or less. 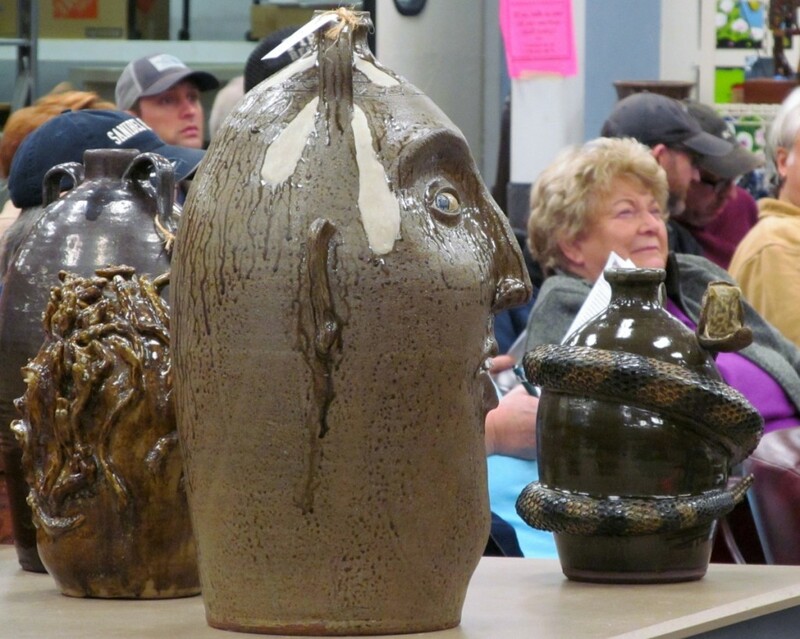 COMMERCE, GA. – A winter folk pottery and folk art auction was presented on January 12 by the Rockabilly Auction Company, which is appropriately located on Pottery Factory Drive. Commerce is in the rolling foothills of the mountains that straddle the Carolinas, Tennessee and Georgia, an area that has historically been the source of most Southern pottery for more than two centuries. Rockabilly sales are reminiscent of old-time country sales. The only significant touch of today’s modern auction environment is online bidding. Online bidders won some 40 percent of the lots sold in this sale, including many of the higher priced lots. There is no slick, four-color printed catalog and few really high-dollar lots that generally are out of most collectors’ reach. This approach brought out a full house of onsite bidders, some 150 in all, with no staff desk manning a bank of phones to accept phone bids, although phone bids were accepted. To build on that “old-timey” feel, a number of lots that were not included in the online-accessible sale followed after the online sale was completed. That said, the sale had excellent examples of many of the most highly collectible potters. 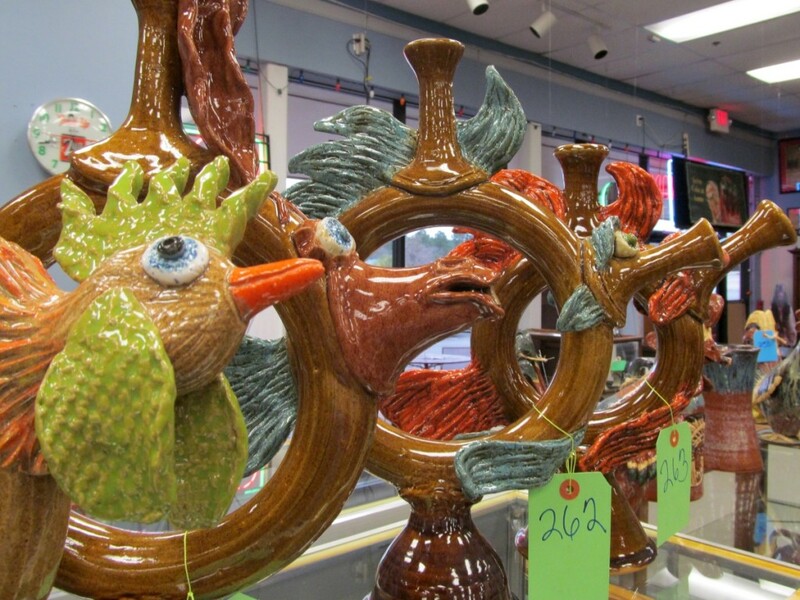 Located within 40 miles of the Meaders family potteries in Cleveland, Ga., there were dozens of Meaders family examples. The lots were presented with a continual mix of pottery, folk art and artists that kept most in-house bidders present for the entire sale. No mass exit at the end of all the pottery lots or of any specific artist’s work. 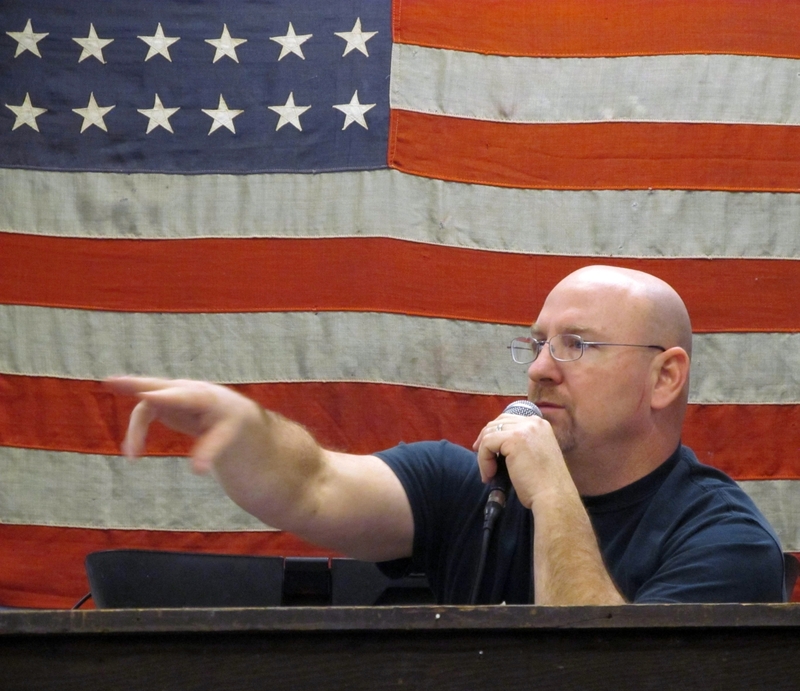 Auctioneer Kurt Kilgore works against a backdrop of a military-base-size, 48-star American flag. Dozens of face jugs were offered. Synonymous with face jugs is Lanier Meaders and others of the Meaders clan. Many of Lanier’s most prized examples are the earlier works with small rocks imbedded as teeth and/or eyes in the face. Later examples frequently utilized pieces of broken china dishes. Eleven Lanier face jugs, including eight rock tooth examples, brought prices consistent with most recent folk pottery sales around the United States. Lanier’s examples ranged from $780 for a china tooth to $2,760 for a rock tooth devil face. Lanier works other than face jugs usually draw lower prices even though his excellent forms and glazes should do better. Among these were an unusual small toothpick holder, probably to make use of a small scrap of clay, for only $150 and his “last piece,” a pitcher made in collaboration with David Meaders, at $840. Additional Meaders face jugs by the Cleater and Billie collaboration, Reggie, Anita, David, Arie, Clete, John, Ruby and C.J. were sold. Other Meaders’ forms in addition to face jugs were sold. Among these was a Reggie face wig stand jug, which brought a strong $510. Edwin Meaders is most known for his pedestal roosters. Among the 30 Edwin Meaders lots were 23 roosters, two pedestal owls and five face jugs. His roosters are presented in three different forms: the simple bird, two- or three-headed versions and roosters decorated with snakes and/or grapes. An Edwin Meaders face jug variation is the cigar smoking face. Two such examples, both dark blue glazed, signed and dated 2011, brought $540 and $600. His two rich blue-glazed owls standing on a branch brought $780 and $900. Any collector of Meaders’ work should have considered statuary forms by Lin Craven. 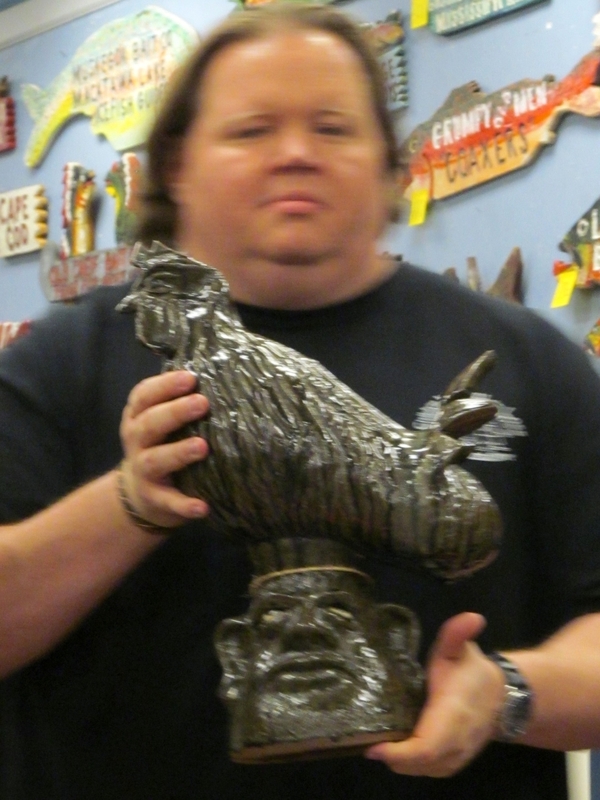 A statue of Edwin holding a miniature blue face jug sold for $870. Craven, known for her statuary forms, also produced statues of John and Reggie Meaders that brought $330 and $450, respectively. There were 30 lots of Lin Craven’s work in this sale, including an unusual form, the bobblehead. 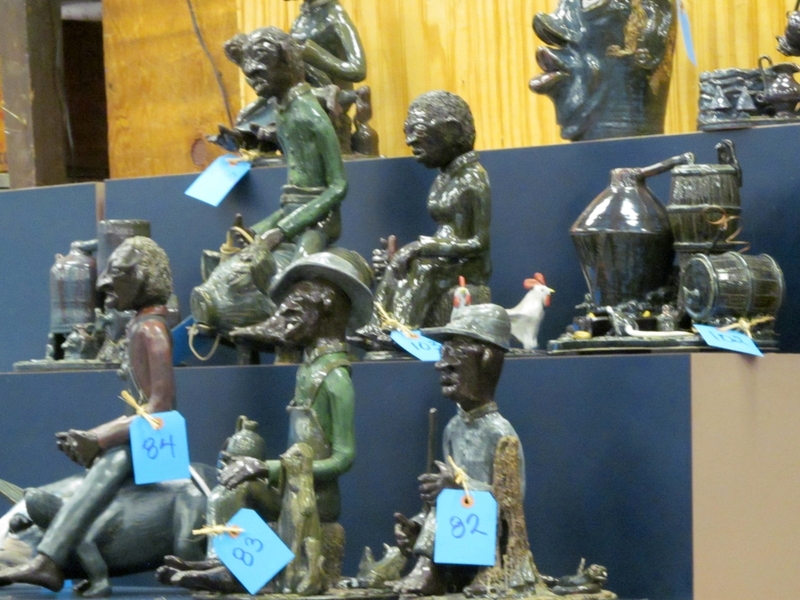 The five bobbleheads offered were all sculptural animals and sold from $150 to $240. The Craven family have been active potters in America for nearly 300 years. Work by Mike Craven was also offered in this sale. Other recognized potters’ works included four lots of Marie Rogers’ work, each with two examples, that were somewhat weak. A single Gordy Pottery lot with three items also was soft at $72 for all. A number of Santa Claus-themed lots by the late Georgia potter Larry Wilson mostly brought $120 or less. 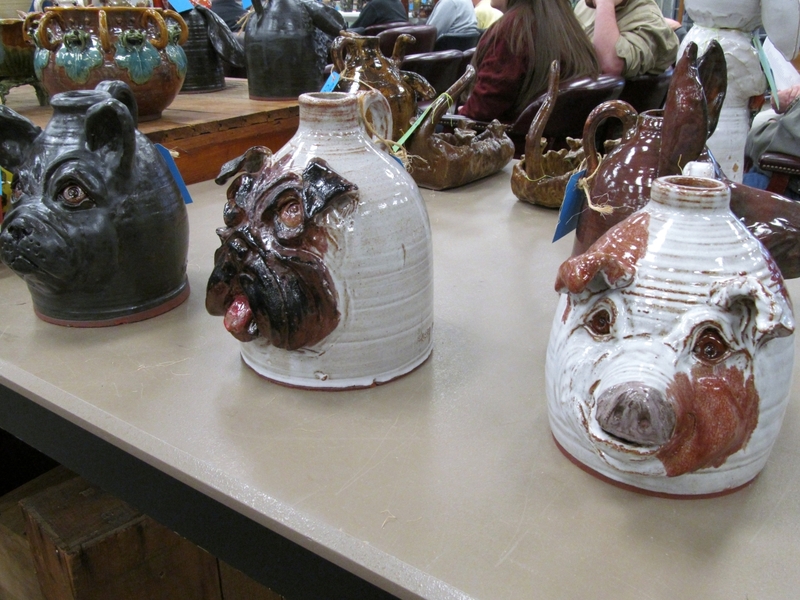 If animals are your interest, the animal head jugs of Huey and Anne Wheeler were well-executed items at moderate prices. 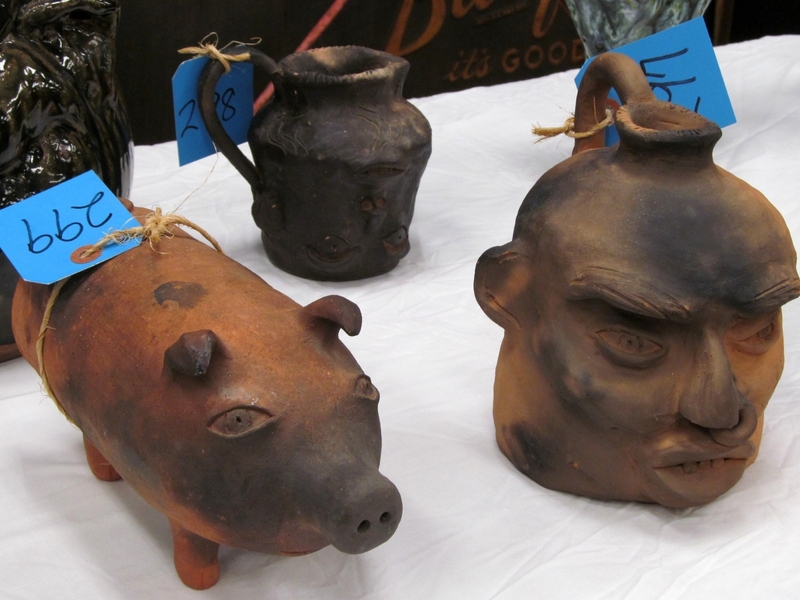 Likewise, pots by Chester Hewell attracted much interest, especially a particularly large 10-gallon face jug at $900. A group of Lin Craven sculpture forms. This group represented a moonshine still and various black folks at some task. Other potters represented in this sale included the Crockers (Michael and Melvin, Dwayne, Pauline), Burlon Craig, Randy Tobias, Steve Turpin, Kim T. Black, Yardbird (Jerry Yarbrough), Bo Thompson, Wilford Dean, Roger Corn and the Fergusons (Stanley, Bobby and Mary). 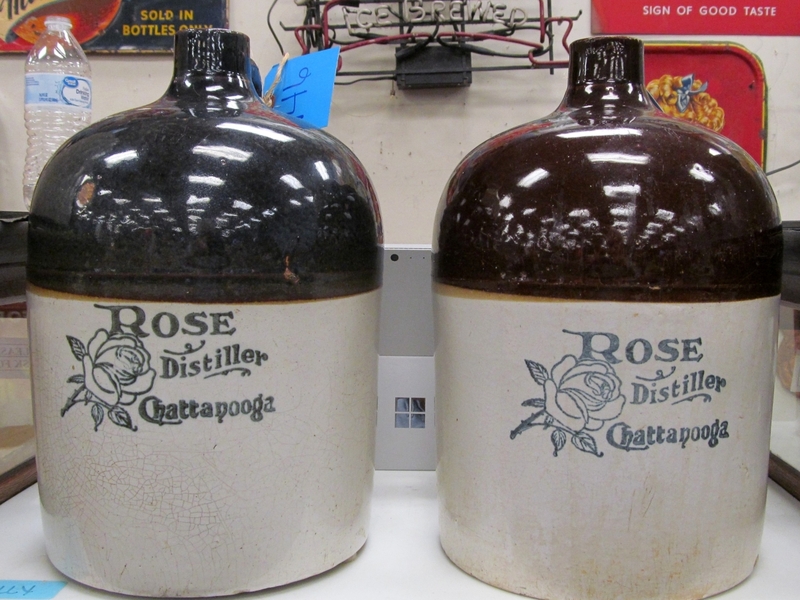 An unusually large number of commercial jugs were sold, including railroad and whiskey distiller marked examples. Frequently, these items are “also rans” in folk pottery sales but were particularly strong in this sale, with many significantly exceeding expectations. For the railroad collector, a D L & W (Delaware, Lackawanna & Western) RR example sold for $360, and a cobalt-marked Rock Island Line sold for $330. RM Rose Distillers, predecessor of Four Roses, from both Chattanooga and Atlanta, were also particularly strong. Top distiller jug was a Rose Chattanooga jug at $930, with estimate of $200/400. Related to the commercial jugs were two crocks, including a Red Wing 3-gallon at $60 and an 8-gallon Robinson Ransbottom with original wood bale handles for $180 . Every sale has its surprises. One surprise in this sale was a simple 1-gallon brown-glazed jug by a little-known 1920s Georgia potter, C. (Curtis) G. Bishop. Seldom seen, this jug with impressed maker’s mark sold for $600, more than triple the high estimate. Another surprise was an unusual subject, a sculptural wooly mammoth, by Cleveland, Ga., potter Rex Hogan. With minor faults, it still managed to reach $570, nearly beating expectations. Another damaged lot that did well was the lone Crawford County example. With proper top of the handle impressed markings, “BM” and “5,” a lidded Billy Merritt 5-gallon double loop handle storage jar exceeded estimates bringing $660. While the majority of this sale offered folk pottery, the folk art lots included iconic artists such as Rev. Howard Finster, Mary Proctor and R.A. Miller. The 11 Finster lots included many frequently seen items, such as his Coca Cola bottle, angel, Elvis at three and limo-painted wood cutouts with their lettered scriptural messages. A small bird house at $390 (the lowest priced Finster in this sale) and a “Who Will Take Care of the Last Animals” painting for $630 were the only somewhat unusual Finster offerings. Likewise, the two Mary Proctor paintings sold were not particularly noteworthy. Proctor is best known for large works, frequently painted on doors, with both scriptural or women’s rights messages lettered on them. The three small, 8-by-10-inch Proctor paintings in this sale fetched $120 each. They were paint and mixed media with lettered message, one with pieces of dollar bills, another with S&H trading stamps and the last with packaging labels. Clint Alderman’s 10-gallon double handle face jug appears to be watching the action from a display table in the center of the bidder’s seating area. He brought a respectable $900 when his turn came. R.A. Miller is known for both painted cutout metal forms and conventional paintings. 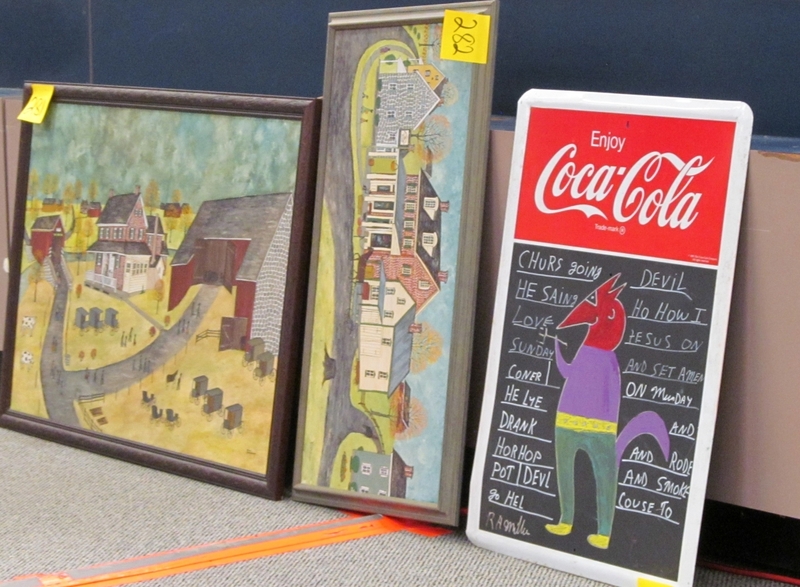 His sole offering in this sale was a 20-by-28-inch Coca Cola menu board with a devil painting his message that sold for $360. A typical John Anderson, aka Cornbread, rooster painting on wood panel (49 by 32 inches) reached $540. Two examples of Amish scenes by Delores Harkenberger, widely known as the Grandma Moses of the Pennsylvania Dutch country, were sold for $420 each. One featured a barn serving as a church with multiple Amish wagons and coaches and the other portrayed a general store and houses. Each of these drew a fairly typical price for her works. Other folk art included two colorful Sam G. (Granger) Blues 132/3 oil on plywood paintings at $270 and $360. For the starting or casual collector, a number of Kevin Burchett paintings were scattered throughout the sale, ranging from only $60 to $240. 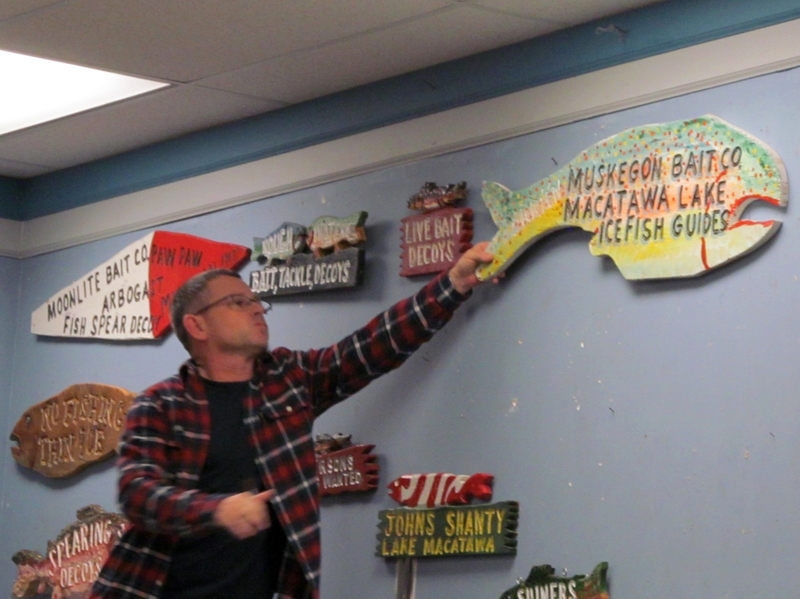 Burchett is a local artist in Commerce who creates pencil drawings and oil on plywood folk images. Many of his works reflect old family stories. This online sale was followed with some unsold lots from the online as well as more than 50 lots of additional material. Prices given include the buyer’s premium. Many attendees at the Rockabilly Auctions frequently also visit the Red Hound Antiques Mall (redhoundantiquemarket.com, 706-335-3353) and the Walls of Books old book shop (706-335-2665), both within a few steps. All are about 70 miles from Atlanta, right off I-85. Rockabilly Auctions is a full-service auction house that frequently conducts folk pottery and art auctions, advertising auctions and other collectibles sales. An upcoming March sale will focus on autographed baseball and other sports items. For information, www.rockabilly.com or 770-652-8075. 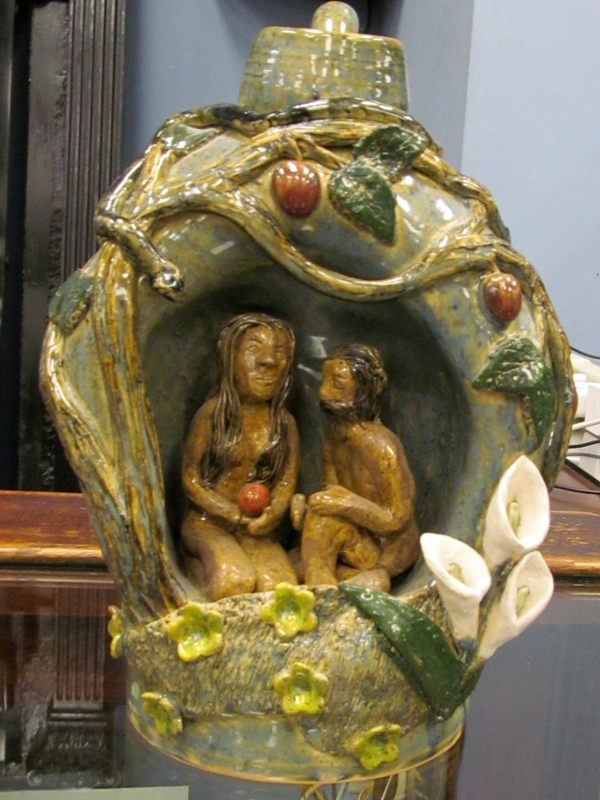 Signed and dated as a “prototype,” Lin Craven combined the popular folk art Adam and Eve imagery with a jug form. The embarrassed couple are placed in a tree-trunk-form jug with entwined serpent. “Temptation” cost $480.